Together, as Tri Deltas, we have renewed our commitment to kindness which has been a part of who we are and how we show up in the world since our founding in 1888. Today, our members are focusing on this virtue and working to Live Kind and Lead Kind throughout their collegiate membership. Many of our members chose to use their spring breaks to volunteer in other communities and give back to those in need. For Jamie Simon, Vermont, wanting to do more with her spring break and having the opportunity to make a large difference in a small community is something she knew she was meant to do. As a sophomore at the University of Vermont, Jamie applied to take part in the university’s Alternative Spring Break Program. She initially did not know in which state she would be placed to volunteer or what kind of service she would be assigned to, but given her elementary education and special education major, she hoped to work with children. A few weeks later, she was selected with seven other women, to work at SISU, an integrated early learning preschool in Gainesville, Georgia. On March 12-16, Jamie and her new friends began volunteering in the classrooms, helping to organize the library, and even shadowing occupational and physical therapists in the school setting. Jamie’s alternative spring break provided her with an opportunity to spread kindness and enhanced her passion for elementary and special education. For Kelsey Morihara, Creighton, the passion to Live Kind and Lead Kind started in high school but continued in college as she has experienced three alternative breaks. 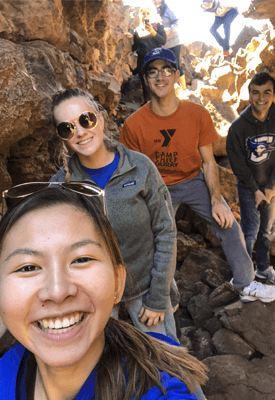 A junior majoring in exercise science and pre-health professions with a minor in theology, Kelsey took advantage of the alternative fall and spring breaks provided by Creighton’s Schlegel Center for Service and Justice. During her fall break as a sophomore, Kelsey went on her first Service and Justice trip to Denver, Colorado, to learn about homelessness, education, immigration and sustainability. She coordinated her second trip to Milwaukee, Wisconsin, where she learned more about homelessness and spent time eating and conversing with guests at different sites. On March 10-17, Kelsey spread kindness through the community of Anthony, New Mexico, where she had the opportunity to spend the night at El Calvario Methodist Church. This church is in Las Cruses, New Mexico, and serves as a refugee center every Tuesday and Wednesday. Kelsey and other members on the trip welcomed people into the church, served and ate dinner with them, spent time getting to know them and assisted them with their next travel preparations. Later in the week, the group stayed at the Women’s Intercultural Center where they danced Zumba with the women, and helped U.S. residents practice for their immigration test. They also went to a district court where they observed court cases, many involving immigrants, and met a magistrate district judge who welcomed them, answered questions and encouraged them to continue to advocate for positive change.